Apart from the missing chapter ring, is everything else ok with this 7040? Cheers. Just looking on my phone so can’t see the dial detail, but the hands and insert are aftermarket. The polished case doesn’t look great either. Does that price tag really say £450? I could sell you a really nice all original one for that. Last edited by JasonM; 8th February 2019 at 14:47. It is £450 indeed :). Local antique dealer selling on behalf of American acquaintance. He hadn’t even noticed the missing chapter ring. What do you think would be a fair price considering? This is a very poor example. I'm certainly no expert but this looks like it's made up entirely of after market parts. Has the case been buffed to a mirror finish? Where have you seen this advertised? I would stay well clear if I were you. It would cost a fair bit to source decent parts and rework the case to brushed finish. I think maybe £150-200 but I probably would even pay that for it. £450 isn’t a outrageous price for a 6309 but it would have to be super clean and very original. The dial is a horrendous fake, the hands and insert are aftermarket, and the case has been held against a buffing wheel to completely destroy all definition it would have originally had. The larger than original font of the lettering and numbers at "6" on the dial is the immediate giveaway to it's origins. Polished case. Aftermarket insert. Aftermarket hands. At £450, walk away. But....those hands are interesting. If you get a chance would you ask the seller where he got them? Makes you wonder how an antiques dealer has a faked out 6309 for £450. I’d hazzard a guess they got duped themselves maybe? Perhaps had a quick ref online and thought, yep we’ll have that. 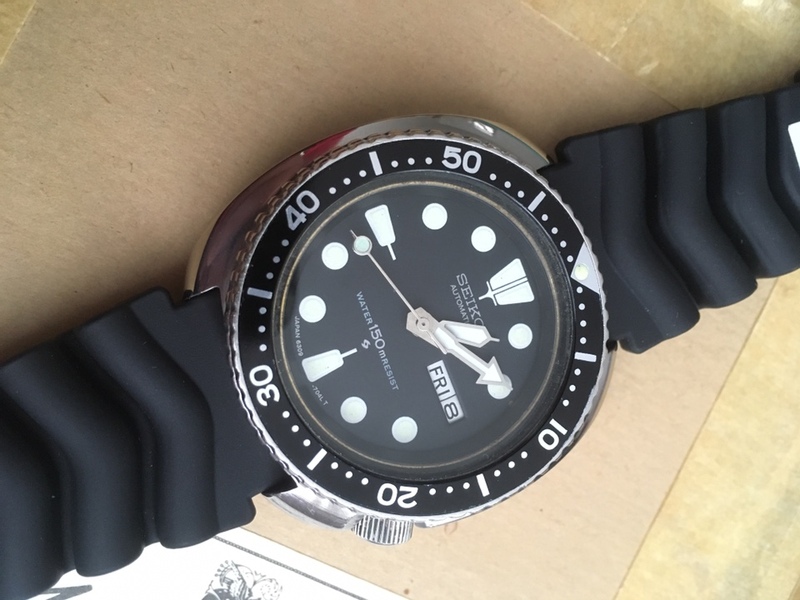 Your average jo most likely wouldn’t consider Seiko parts being faked. How can you tell the hands are aftermarket? Have two of these myself and keen to learn. The seconds hand is easy, the metal ring surrounding the lume should be wider and flat, not looking like a wire. Minute and hour hands can be trickier to spot as the aftermarket ones of these have got better over the years. There's a couple of ebay sellers who regularly sell ones that look like this. A few months ago I took a look at the serial numbers on one of the sellers 'sold' items and it turned out that he had some where the reference numbers followed on. The chances of this happening are astronomical. Plus he had sold too many..... Movement aside, they were all 100% fake. Dial, hands, bezel, bezel insert, case and case back. Out of interest, is there a recognised / established modern replacement 'drop in' movement for a tired 6309? My 6309-7290 is running very fast ie 60+ secs / day. It had a full service with a seiko specialist about 6 yrs ago, but even immediately after that it was still 30-40 secs/day fast. I don't think there is a modern replacement but you could drop a 7548 or 7546 quartz movement in it, plug and play and accurate to a few seconds a month. I am seeing him again Tuesday and will forward forum’s advise :). 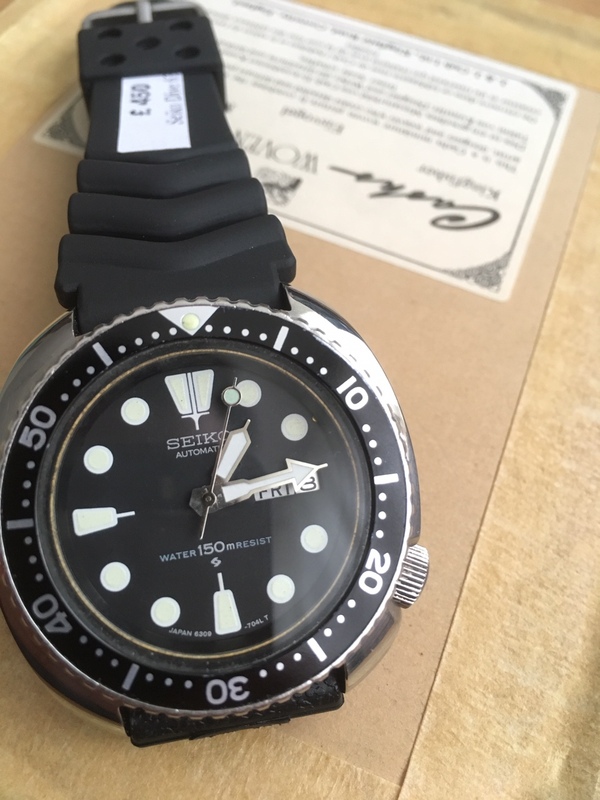 Said he received a few Seiko divers from America. In good faith they were all good. Cleaned and serviced even. Thanks! Checked my 6309s, one original and one aftermarket as expected. You could try taking the back off and looking at the adjuster. It could be a simple fix to get it down to +/- 20 secs per day.